The Chairman of the Ghana League Clubs Association [GHALCA], Kudjoe Fianoo has taken a massive swipe at the president of the Ghana Football Association, Kwesi Nyantakyi insisting he travels like a pilot. The CAF 1st vice was in Slovakia for the 42nd EUFA Congress and couldn't make it to the launch of the 2017/18 Ghana Premier League at the headquarters of the country's football governing body has raised many eyebrows. 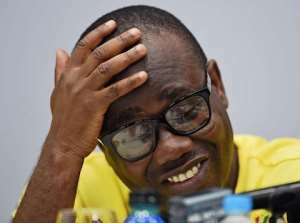 And according to the seasoned football administrator, the current Nyantakyi administration is not interested in the development of football. “The current Ghana FA leadership being led by Kwesi Nyantakyi has no interest in Ghana football again," Fianoo told Accra based Asempa FM. The FA president himself travels more than some pilots," he added.